In Alaska, roadside camping is allowed along many of the rural roads and for good reason; safety of the occupants is just one but it makes sense that Alaska provides areas for pulling off the road when the drivers are tired. Alaska Roadside Camping is legal in most areas; here's the scoop. For reasons of safety alone in a state as large as Alaska, pulling off the road when tired is encouraged and completely acceptable too. Alaska is known for its magnificent scenery and enormous natural landscapes. While these features are often the reason we go camping in Alaska as well as make visiting Alaska a truly memorable experience, they are also the cause for some concern. Our roads are dangerous enough to drive with the abundance of wildlife that all too often ventures out into oncoming traffic. Now factor in the distracted drivers and add in a drowsy aspect too and the formula for disaster is brewing in a hurry. Alaska state officials named the Seward Highway “The most dangerous highway in Alaska.” Here are some of the reasons and they play a lot into the decision to allow roadside overnight stays along these dangerous roads. Sharp turns, abrupt shoulder drop-offs, the occasional potholes and you can see why the driver needs to be alert and awake when driving in the remoteness of Alaska. Camping near recreational sites can necessitate the need for roadside camping. Bikers and hikers also often need to set up a roadside camp for obvious reasons too. Alaska law permits limited camping to to accommodate these special outdoor recreational styles. 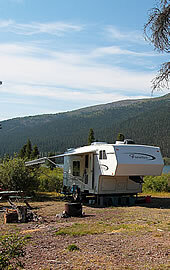 Pitching tents next to Alaska's roadsides can best be done in one of the supplied roadside rest areas or at any wide pullouts. While typically there is no support system, toilets or fresh water, this is still a popular and common form of camping in Alaska. While it is common to pitch tents along Alaska's scenic highways it is respectful to always leaving your campsite cleaner than you found it. Roadside campers should take the time to return the campsite to the state it was found in or as close as possible to protect the right to continue with this in the future. NOTE: The State of Alaska is currently putting up signs prohibiting roadside camping in many areas. Be aware of this but by all means if you are tired do not hesitate to pull over and take a nap. Setting Up Camp or Stopping For The Night? Should the need arise that you need to stop and get some shuteye, do it. If you are ticketed by a State Trooper you have the legal system and years of history on your side. But really, unless your setting up a long term camp there is little chance you're going to be bothered. Safety always comes first and as long as you're not impeding traffic or causing an unsafe condition, there is little chance you will encounter anything other than a wellness check.